The explosion of self-publishing has flooded the web with a great many sites explaining how it works, and discuss the ebook industry at length. AuthorEarnings is a great source of insight and analysis. Rüdiger Wischenbart’s Global eBook report (€20), started in 2011, is an excellent reference to worldwide digital consumer market developments. The old EPUB trade association is now part of the W3C, and called Publishing@W3C. Assessing ebook sales figures is a challenge mainly because Amazon, the largest U.S. reseller, doesn’t provide market data (beyond sweepingly broad statements). Amazon doesn’t have to, so it doesn’t. As a result there’s a great deal of guessing and a smidgen of surmising regarding the actual success of ebooks in the U.S. market. Compounding the problem is the multivariate nature of book publishing. Outsiders see just one big book publishing industry, but book publishing is a conglomerate of discrete though overlapping sectors, including children’s books, religious, education/textbooks and STM, which is scientific, technical and medical. Different groups define publishing sectors differently, with differing degrees of granularity. Education, for example, is usually broken into two sub-sectors, K-12 (kindergarten to grade 12) and Higher Education (both college and university, including technical colleges). Adult Education is a sometimes third category (for adult continuing education). The most visible sector is consumer publishing, known in the business as “trade publishing.” This category includes everything from popular fiction to diet books. Textbooks comprise a large publishing sector, yet the data suggests that ebooks have had their least penetration here. The books that we keep hearing about as success stories in the ebook market, romances, mysteries, thrillers, and science fiction, between them amount to something less than 5% of the annual sales of the traditional print book market. So while these categories are indeed taking off they really are not representative of the book industry as a whole. Still they may be harbingers of a broader trend. We just can’t be certain at this point. The International Digital Publishing Forum (IDPF) used to collect quarterly U.S. trade retail ebook sales in conjunction with the Association of American Publishers (AAP). This stopped in fall, 2010. The Association of American Publishers (AAP) continued to report ebook sales until July 2011. Then it announced, jointly with BISG, the Book Industry Study Group, the BookStats report ($695 & up for association members; $995 and up for non-members). 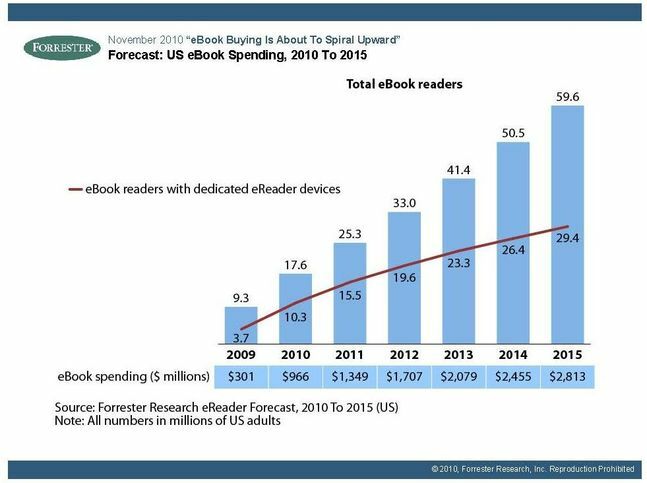 Forrester published an analysis of ebook trends in its US ebook Forecast, 2010 to 2015 ($499). The success of ebooks can be tied directly to Jeff Bezos’s fearless plan to introduce the Kindle e-reader into the market in late 2007. Anyone could have told you that it would be a flop (as I did at the time). Dedicated e-readers, a range of them, had failed before, and the first Kindle was offered at a retail price of $399 (vs. today at as little at $69 [with ads], $89 without ads). But Amazon, or rather Bezos, had a vision of where the market could go. He relentlessly promoted his vision and made the ebook market happen. Hats off to him. Barnes & Noble remains the largest U.S. competitor to Amazon for dedicated e-readers. Kobo has been a solid international player, and now with strong alliances across Europe is set to stay in the big leagues. Sony, the earliest of the current round of vendors, has fallen substantially behind its competitors. Google is an ebook vendor without dedicated e-reader hardware. Personal computers are a major e-reading platform, and the key e-tailers offer dedicated reading software for the PC and the Macintosh. Smartphones are often discussed as important e-reading platforms, although none of the vendors places much emphasis on these devices. Apple’s iPad has changed our perspective on the e-reader — the iPad remains one of the most remarkable product launches in the history of personal computing. Amazon’s Kindle Fire successfully competes (at half the iPad Mini’s price), keeping the company with one foot solidly in e-readers and another in tablets. While the iPad is an excellent reading device, Apple has mostly dropped the ball in the iBookstore. Where it’s succeeding is with apps, video and music. Barnes & Noble’s Nook Tablets are on the clearance table as of this writing. The company made a valiant effort to compete with Amazon and Apple, but discontinued manufacturing tablets in June, 2013. Research from Bowker and the Book Industry Study Group (BISG) shows that tablets are quickly gaining ground on ereaders. It’s reasonable to assume that the power readers who gravitated to dedicated ereaders mostly own one of these devices. While apps have moved beyond the Apple iOS, and Android is providing good run for its money, when it comes to book and magazine apps the iPad remains the the important player. HTML 5 provides much of the robust programmability that is available to IOS Developers though dedicated reader apps continue to link readers directly to resellers. It remains to be seen when the first “killer” app is launched, either as a reader or a standalone publication. The easiest way to understand the challenges for the large traditional book publishing companies is to think about the recent history of the large traditional music companies. The story is much the same. Traditional book publishers were caught off guard by the explosion in ebooks and have been fighting a rear guard action for several years now. There is no blame. In retrospect the success of ebooks appears inevitable. That’s not at all how it appeared from the ground at the time. We knew it was coming. We just didn’t reckon on how far or how fast. Like music publishers the digitization of physical books is proving mightily disruptive to the publishers’ business model. The sales volume does not support the current infrastructure. The most successful ebooks are text only ebooks. There best suited to today’s devices which accentuate recalling text on monochrome screens and are not well-suited to the display of beautiful color illustrations in just a few words. The iPad is an ideal children’s book device from a content perspective. It’s not the ideal device, at nearly $750, to hand to a five-year-old child. A lot of children’s books have now been offered a simple conversion into any reader format. They don’t look very good, and they’re not selling very well. Several projects have been created specifically to take advantage of the devices. eTextbooks are largely a no-show despite the many titles now available. However the uptake in adoption in college and university students has been slow. On the one hand it would appear that this group of largely young and tech savvy individuals would be prime for digital textbooks. It hasn’t been the case. Here are some articles and links that examine aspects of the challenge. When we talk about enhanced ebooks we’re reacting more to the possibilities inherent in the hardware than to the demands of authors and their work. Most ebooks derive from already printed books; books were not written to be able to take advantage of the kind of fancy features suggested by an “enhanced ebook”. Creating enhanced ebooks is going to demand a lot of creativity, which in turn demands money and development cycles. The market isn’t there yet to support the business model. Nonetheless there are some interesting explorations under way. I’ve considered the challenges of ebook formatting in a couple of recent blog entries and will refer you to those rather than repeating myself here. The international market for ebooks remains well behind the US market. There are several reasons, including slower introduction of devices and software and differing laws and customs surrounding book publishing in Europe and Asia. O’Reilly has just released a very comprehensive report on international markets free books and I link to that below. The happiest part of the ebook saga has been the success now being enjoyed by self published authors. It’s not just the big indie bestsellers, although they are certainly awe-inspiring in themselves. Ebooks have removed the stigma from self-publishing. Long tarnished with the label “vanity publishing”, there was hardly a bookstore in the country that would stock these titles and get behind them. The power of bookstores has waned now that files are digital and Amazon is the 800-pound gorilla. Authors can go direct. The Internet opens an array of mechanisms for self-published authors to reach out to readers directly and to offer them their books, easily and inexpensively produced, for just a few dollars. It’s early days still, but this is the great happy making story of the ebook revolution and the possibilities at this point appear limitless. DVDs of films, music CDs, and printed books share a common trait. They are all physical embodiments of creative expression. Unlike a sandwich that you eat or a car that you drive, these artifacts are waystations between the creative “artist” and the interested consumer. They are experienced through sound and vision, but mostly through the interpretations of the sights and sounds, and, in the case of books, in seeing letter shapes, recognizing those as forming words, and interacting to the ideas and feelings those words engender in the reader. Pricing for creative products follows a calamitous bunch of non-rules, traditions and general mayhem. Novelty weights in for music and film more than for books: you can expect to pay extra for a newly-released film on DVD or hit music CD for the first couple of months (books usually don’t hit the remainder table for a year or more after release. But then DVDs and CDs eventually do also). Movies in theaters cost the same regardless of quality or length, until they move on to repertory theaters. Live music concerts are priced according to what the market will bear. Most book readings are free, designed to sell books. Promoting the sale of a new (CD and download) release is the main reason that a band tours, but you still have to pay. Of course almost all the music stores are out of business now, because online undercut them on price and selection. And then Steve Jobs decided that a song should be 99 cents. Ebook pricing comes from a wacky analog tradition, so, thus far it’s wacky. There are several additional aspects to the pricing story. 1. The ebooks saga demonstrates that from a consumer perspective either existing print books have been overpriced, or that that there was an enormous untapped market for reading from people who are willing to pay two or three dollars for a book around happy paying eight, 10 or more. Most ebooks offer a substantial price reduction from the corresponding hardcover or paper edition. What’s been surprising to me has been the vehemence of consumers that this should be so. Pricing is perception. There’s no point in explaining to people that the printed cost of the book was generally only 10% of cover price and that removing that does not in fact make the whole publishing process inexpensive. From their point of view what they were buying was the physical object, the artefact, and once the artefact becomes pixels, it’s not worth much more than a song, as Steve Jobs taught us that songs cost a buck. 2. Ebooks have also introduced into the marketplace the concept of variable pricing for the same book. Publishers are just beginning to learn the possibilities. In one scenario a book is launched at a very low price in order to get a large number of readers engaged with the book. Once engaged the publisher can raise the price as word-of-mouth reaches people who are willing to spend a few extra dollars to buy a book that they now have heard from friends is a good read. At the same time online resellers like Amazon and Barnes & Noble are experimenting with price promotions and finding that they can create a lot of momentum behind featured titles. 3. There’s a big problem afoot in trying to hold pricing between various online resellers of ebooks. If you look at just about any title you’ll find significant disparities between Amazon, Apple, and Barnes & Noble. Whether this is very important to consumers is unproven though we do have lots of proof that they are very price sensitive generally speaking. Amazon tried to force the price of the books down too far too fast, and the publishers fought back what was called the agency model whereby they are able to set a retail price that Amazon can move from. Amazon fought back against this by restricting publisher’s access to this pricing model to only the six largest publishers in New York, this story is still unfolding. Metadata is the canary in the coal mine when it comes to ebook marketing. It’s tacky, poorly documented and poorly implemented and publishers just aren’t getting it. Nor are online he tailors being helpful. The publishing industry gathered together some time ago to enable a robust standard, called ONIX, that can provide remarkably rich data about each ebook but the industry and resellers has not gotten fully behind the standard. I’ve been covering this issue separately in a series of blog entries both on this site and on The Metadata Handbook site. When I refer to ebook software vendors I’m talking about the vendors that provide the software that can be used to convert or create ebooks. Ebooks today are very ugly, I call it simple, and the software used to create these ugly files is quite ugly in turn. I think the industry sprang up so quickly that software developers have not had a chance to respond. The same time there are not awful lot more readers than there are publishers and so the software opportunity is no arch. There are two main types of situations that lead to the creation of an ebook. One is where an author self publishes a book, working from a Word file, or similar and trying, what with very sparse technical skills, to just get the darn thing out there. The far more common situation, certainly in terms of the number of titles, and in terms of the “important” titles, is where a file that had been created print a book is then converted, dumbed down, into an ebook format. There’s a huge disparity in the skill level of civilian authors versus the highly trained and relatively well-paid production staff of the large book publishing companies and their suppliers. So at the high-end are the traditional book pagination programs such as Adobe in design and QuarkXPress. At the low end are open source tools and a bunch of kludges. These links offer you additional information. Most book publishers no longer do their own typesetting and design in-house. They have farmed it out for some time now. Mostly it was sent to mom-and-pop shops around the US, while the very large publishers have begun to switch portion of their composition to offshore vendors in India. These Indian vendors are very skilled in publishing automation and data tagging approaches to page automation and so are ideally suited to the conversion of the book files. It’s safe to say that without these suppliers able to provide very high volumes at very good prices with the consistent level of quality the book market would not be as advanced as it is today. 1. Of course there are numerous good ebook websites and blogs. There are three that compete to cover the news, each performing well. There’s some overlap, but each has its own personality. Good E-Reader Blog: Michael Kozlowski works hard to report on all the news. The Digital Reader: Charting the eBook Evolution since 2010. The advantage of this site is that blogger Nate Hoffelder is both knowledgeable and opinionated. MobileRead: A specialized ebook site with some very active reader forums. Digital Book World: I sometimes write for this comprehensive site: numerous voices find a home here. Publishing Business Today: An excellent (free) 5-day/week newsletter, offered by the publisher of Book Business and Publishing Executive magazines. Subscriptions here. 2. Wikipedia offers a Comparison of ebook readers. The list provides links to additional data on most of the readers mentioned. We can feel proud of the hardworking volunteers at Project Gutenberg. The late Michael Hart, founder of Project Gutenberg, is said to have invented ebooks in 1971 (ASCII text only). Today the Project features over 46,000 free books, with million of ebooks downloaded each month. This site has been a powerful force in the development of the e-publishing industry.